Is the FBI Keeping Tabs on Shareholder Proponents? In mid-December, as noted in this memo, the European Commission published an Action Plan with initiatives it intends to undertake in 2013 in the fields of EU company law and corporate governance. These initiatives are primarily inspired by the responses to the Commission’s 2011 Green Paper on the EU corporate governance framework and an on-line consultation on the future of European company law. They are aimed at enhancing transparency, engaging shareholders and simplifying cross-border operations of EU companies. The Commission further plans to codify a number of major EU company law directives. The action plan comes in response to a 2010 “green paper” on corporate governance that in turn stemmed from concerns over governance failing evidenced during the recent financial crisis. The plan effectively details initiatives regulators will take to “modernize” corporate governance with a focus on enhancing corporate transparency and empowering investors to be better stewards. – Disclosure of voting and engagement policies as well as voting records by institutional investors, improving transparency on remuneration policies and individual remuneration of directors, granting shareholders the right to vote on the remuneration policy, and improving shareholder control over related-party transactions could be addressed in 2013 through the shareholder rights’ directive. Reaction to proposed initiates has largely been muted as interested parties wait on further details. The proposals, moreover, are largely in line with best practice guidance in the U.K. while elements of the action plan – such as mandatory say-on-pay voting – are prevalent in other European capital markets. Act Now: Get this issue for free when you try a 2013 No-Risk Trial today. What If ISS Was Owned By An Activist Hedge Fund? Comic book aficionados love the “what if” scenarios. For example, what if Conan battled Thor? Anyways, as noted in this Financial Times article, ValueAct Capital, an activist hedge fund, disclosed last month a 5% stake in MSCI, which owns ISS. What do you think the potential consequences could be if they increased their holdings to a controlling position? Is this different than Glass Lewis being owned by the Ontario Teachers’ Pension Plan? The courts continue to pose one of the biggest threats to the SEC’s ability to do its job. As noted in this DealBook piece, Judge Richard Leon of the Federal District Court in DC has held up a FCPA settlement for nearly two years because of his demands for greater disclosure. As noted in this “Dodd-Frank Blog” by Ethan Mark of Leonard Street, the SEC has adopted rules applying the same type of escheatment procedures to brokers as it does to transfer agents. Last Thursday, ISS updated its Compensation FAQs and Non-Compensation FAQs relating to its proxy voting policies issued last month. ISS separately had issued Peer Group FAQs a few weeks ago. We are posting memos regarding these FAQs in our “ISS” Practice Area. Last Friday, the SEC shed Paul Beswick’s “Acting” status as he was tapped to become Chief Accountant. Paul was named Acting Chief Accountant when Jim Kroeker left the position in the summer. SEC Enforcement Chief Khuzami to Leave? The Fiscal Cliff: How Many at the SEC Will Be Furloughed? Hopefully this will be my last blog of this year – trying a blog vacation next week – and with the fiscal cliff looming, the federal agencies are gearing up for the consequences. Furloughs galore. See this Washington Post article and this Government Executive piece. Hat tip to Dan Pliskin for reminding me about it! – What is ExecComp Analytics? – What was your goal in creating it? – Any surprises so far since it went live? Meanwhile, the SEC issued this order on Monday approving the PCAOB’s Auditing Standard No. 16, Communications with Audit Committees (see this Gibson Dunn blog and Morrison & Foerster blog on impact on EGCs). And the SEC posted this report to Congress on assigned credit ratings yesterday. Nasdaq has just filed an amendment to its proposed rules relating to compensation committee independence and consultants. The change addresses a troublesome timing problem with the original proposal. Proposed Rule 5605(d)(3) states that a compensation committee must have the specific responsibilities and authority necessary to comply with Rule 10C-1(b)(2), (3) and (4)(i)-(vi) under the Exchange Act relating to the retention, compensation, oversight and funding of compensation consultants, legal counsel and other compensation advisers, and is required to consider the six independence factors enumerated in Rule 10C-1(b)(4) before selecting, or receiving advice from, these advisers. Originally, these provisions – that is, requiring that the committee be granted the specific authority and responsibility referenced in Rule 5605(d)(3) — were to have become immediately effective upon approval of the Nasdaq proposal by the SEC, creating some implementation and coordination problems. Under the amended proposal, Rule 5605(d)(3) will become effective on July 1, 2013; by that date, the committee’s authority and responsibility under Rule 5605(d)(3) must be reflected in the committee charter, resolutions or other board action, as permitted by state law. (Ultimately, the authority and responsibility under Rule 5605(d)(3) must be included in the charter in accordance with the regular transition schedule for these rules.) In addition, under the amendment, Nasdaq proposes that companies comply with the remaining provisions of the amended listing rules by the earlier of (1) their first annual meeting after January 15, 2014 or (2) October 31, 2014. This revision is consistent with the NYSE proposal. Also notable in the amendment is the express deletion of the word “independent” prior to “legal counsel” to make clear that only in-house counsel are excluded from the requirement to consider independence. In addition, the original proposal discussed the committee’s need to consider the six independence factors in “making an independence determination” regarding compensation consultants, legal counsel and other advisers. In the amendment, the concept of an “independence determination” has been deleted, with the reference now only to the need to consider the six factors before selecting, or receiving advice from, these advisers. The deletion may have been intended to emphasize that the committee “is not required to retain an independent compensation adviser.” The addition of the phrase “receiving advice from” makes clear that the analysis cannot be avoided simply by not “selecting” an advisor. The amendment also proposes changes to the phase-in schedule for companies ceasing to be Smaller Reporting Companies, allowing these companies six months, in lieu of the originally proposed 30 days, to certify that they have adopted a formal compensation committee charter. These companies will also be permitted, under the amendment, to phase in fully compliant compensation committees. The proposed form of compensation committee certification is now attached to the amendment to the proposal. The certification will be due 30 days after the final implementation deadline applicable to the company. Yesterday, the SEC announced that Lona Nallengara has been named as Corp Fin’s Acting Director, replacing Meredith Cross until a permanent Director is found. In addition, John Ramsay was named Acting Director of the Division of Trading and Markets. Happy Birthday to the SEC’s Shareholder Proposal Rule! – What are the important legal drivers for board oversight of compliance programs? – Can you provide an overview of board oversight of compliance programs – meaning what sort of information they should receive? – Can you describe more about what you called the operational type of information? – Is there the same type of variation in what you called the case-specific type of information that a board gets? – How does a company make all this happen? Is the starting point with governance documentation? Sensitive, confidential information belonging to major U.S. stock exchanges was at risk of being hacked, according to a new Reuters report. Securities and Exchange Commission Interim Inspector General Jon Rymer wrote in a 43-page report that some SEC staffers had used unprotected government computers at a Black Hat convention this year. This convention attracts hundreds of hacking experts who bring seemingly impenetrable devices with them to see if they can be cracked, says Adam Levin, chairman and cofounder of Credit.com. The SEC said the government-issued computers were not hacked and no unauthorized breach of data occured. According to Reuters, the SEC employees attending the conference had logged into the unencrypted computers through public wireless networks. The Inspector General said the employees, who had worked in the SEC’s Trading and Markets division, were no longer at the federal agency. The SEC has been warning Wall Street firms and and market exchanges to beef up their cyber security efforts. But the government computers brought to the Black Hat convention did not have basic virus protection programs installed and the employees had neglected to encrypt the devices, Reuters reports. And this Reuters article notes that the NYSE has hired former Homeland Security Secretary Michael Chertoff to make sure sensitive exchange data was not breached after securities regulators left their computers unencrypted. – What does Hiperos do? – How does your platform allow companies to facilitate forming their FCPA compliance programs? – Any surprises in creating that platform? – What do you see in 2013 as far as DOJ enforcement of the FCPA is concerned? – What about the regulatory environment in general? 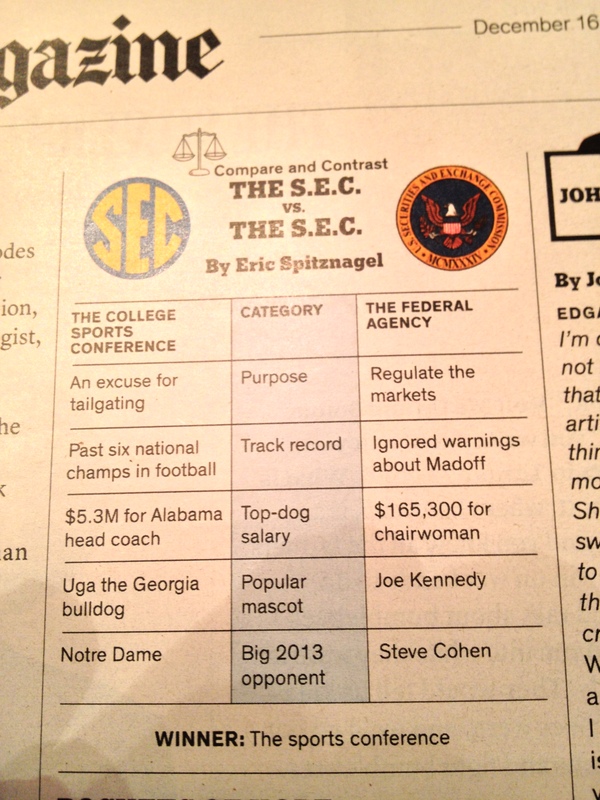 Back in May, I blogged about the madness in the SEC’s Inspector General’s Office. The David Kotz and David Weber show. A soap opera at the SEC like this comes along only once every few generations! A few days ago, the PCAOB released a report summarizing observations from its inspections of audits performed by the 8 largest public accounting firms of their clients’ internal control over financial reporting in 2010. As noted in this blog by the FEI, there is a concern over the increasing rate of deficiencies – up to 22% in ’11 from 15% in ’10. Looking for something different for the new year? Learn about the “Lowell Milken Institute Law Teaching Fellowship” opportunity at UCLA School of Law. – How do the recent changes to the U.S.’s economic sanctions related to Iran implicates disclosures? – What does it mean when you say an issuer must report the activities of affiliates? What’s included in that? – What types of activities need to be disclosed? – How detailed do the disclosures need to be? – Anything else we should know about the disclosure requirements?